Last Saturday at the library, the young girl in front of me checked out Snowflake Bentley, the story of snowflake photographer Wilson Bentley. 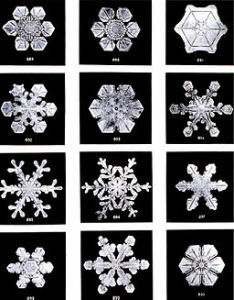 Bentley’s life-long love of snowflakes moved him to study them, to see and capture their hexagonal beauty. It’s not easy to photograph a snowflake; they are tiny and fragile and they melt when held too long or brought inside the house. But Wilson Bentley wanted to share their beauty and structure with the world, so he developed a way to photograph them. Snowflake Bentley’s passion and effort brought snowflakes to the tropics and the deserts, giving them to people who will never see snow flying outside the window. That young girl’s book choice couldn’t be more perfect: what better to read during a blizzard than Snowflake Bentley? The illustrations and words have come alive right outside the window – millions of unique snowflakes just waiting for someone with eyes to see and a heart to appreciate them. I love snow, but I don’t spend a lot of time meditating on each individual snowflake. Even with so many outside my window, it takes seeing a book in the hands of a child to open my eyes to the one-of-a-kind beauty of each snowflake. A passing glance just isn’t enough to see what is right in front of me. The same can be said of God’s wonder-filled world: sometimes it takes a psalm in my hands to give me eyes to see it and a heart to appreciate it. Images of Wilson Bentley’s photographs are from Wikipedia, Snowflake Bentley. The sky is cloudy this morning, and snow is coming. High winds, almost hurricane strength, are on their way. Towns on the seacoast are preparing for storm surge. A blizzard is a fierce storm, and sometimes a destroying one. The last time this happened, the power was out for two days. Storms are giant reminders that I cannot control the world I live in. I can and do prepare – pulling in trash cans and other things that might blow away, filling the bird feeders, having food and candles and batteries at hand – but I cannot control or avoid the storms that visit my home. Unless I leave. For most storms, I’ll stay home; losing power and mobility for a day or two is just an inconvenience. But for those storms that threaten to destroy my home, ones that threaten my life and the lives of those I love, I’ll leave home and possessions to find a safer place. Houses can be rebuilt. There’s a big difference between inconvenience and death dealing destruction. The same is true of the storms in my life that aren’t weather related. Heartache, pain, loss, and death. They hit home, wreaking havoc in my heart, mind, and soul. It’s easy to get lost in these storms; I’ll stay put and take the consequences for most of these, but seek a safe place when it’s beyond my strength. Whatever type of storm comes, I’ll say a prayer for mercy and refuge. I’ll pray for myself and for others. I’ll seek shelter in the storm in the home that can never be destroyed: God’s loving embrace. This weekend, I packed away the Christmas tree, decorations, and angel candlesticks. Then I took this year’s Christmas cards off the beam between the kitchen and living room, taking a few minutes to reread notes and see the handwriting of friends and family. Going through all the cards together I saw something that I’d missed during their gradual accumulation over Advent and Christmas: almost a third of them featured the word JOY. One of my favorites is a simple card with scalloped edges with JOY in red. Beautiful. January is passing and the whole idea of New Year’s resolutions has faded for many if not most of us. I don’t think that’s a bad thing, really. Change that gladdens the heart and quickens the spirit isn’t tied to the changing year: it resides in our hearts and souls. Finding that change is more a matter of hope and patient listening for the voice of the Spirit than of drastic dietary or lifestyle adjustments. I kept a few of this year’s JOY cards. Like favorites from holidays past, they will make good bookmarks, keeping my place as I journey through any number of books. Joy will accompany me through the rest of January and beyond. It’s a good reminder: change that leads to a holy life may require work, but it also brings Joy. It’s a snowy, icy, rainy mix today. Seen from inside a warm house, this is of no consequence; seen out the car windshield, it’s another story. I’m driving the electric Smart Car today, which is surprisingly good on slick roads. Its low center of gravity, good tread on the tires, and ample power when needed make it a good choice in bad weather. It may not look like much, but it travels the road better than many a larger and more obviously impressive vehicle. Centered, a firm grip on the ground, and powerful when needed. Able to travel in uncertain conditions without getting stuck, lost, or becoming a danger to others. These are the qualities that make a car Smart, a friend beloved, and a life well lived. It’s also an accurate description of the life of faith. It’s not about size or flash, taking up the most space or demanding constant attention. It’s about moving toward God, taking care of the others on the road, and staying in the present moment with all its beautiful uncertainty. Smart Car wisdom. After dodging the cold everyone else had over the holidays, I am sniffling my way through the second week of 2015. It’s nothing terrible, but enough to keep me at home and quiet, limiting my activities to what is necessary or can be done without a lot of moving about: enough laundry for everyone to have clean sheets and clothes, enough cooking for meals and lunch boxes, necessary emails, and some writing will be enough for today. I’ll rest now rather than be forced to do so by escalating symptoms and secondary infections. When I let go of my usual activities, I move into a different reality. I quiet my body, mind, heart, and soul. I become acutely aware of this time and this place: breathing, the rain on the window, the scent of candles recently lit. I come upon myself as a self rather than as an active agent in this or that context. A self held by God and aware of it. I don’t need a cold to let go and quiet my self. Prayer and meditation, walking or looking at the ocean can get me there, too. Anywhere and any time, I can let go and give myself back to God. But there’s a cost. Spending time as a full self before God will cost me my faith in and fixation on all the partial selves that are happy to be limited to activities and accomplishments, worries and inabilities – the idolatry of brokenness and pessimism, the lure of surface spirituality, the misguided values that shred the soul and damage the body. Why does it often take an illness to give to God the very things that kill my soul? It’s something I remember from high school math class, shorthand for “if and only if.” It means that one thing will happen only if something else does. Tom will buy apples from Bob IFF Donna buys pears from Tom. If Donna doesn’t buy pears, the Tom and Bob deal falls apart. You can also find IFF in short or long form in logic puzzles and online games. IFF creates conditions that affect everything else, making games more fun and solving puzzles challenging and possible. If and only if. I think New Year’s resolutions often come from a game of “if and only if” we play with ourselves and others. I’ll train for a marathon, keep my home and mind free of clutter, eat only healthy foods, and accomplish more with fewer hours and less effort. Behind these resolutions is this hidden IFF: Happiness/love/success/contentment/worth will be mine if and only if I train for the marathon/keep my home and mind free of clutter/eat only healthy foods/ accomplish more. 1. Unlike games, equations, and puzzles, life is open ended. There are any number of things that can and do happen. If and only if assumes a closed reality. 2. IFF thinking assumes that I know the only or best way something can come about. The conditions I set may not be the way reality works. 3. Usually peace, happiness, love, and worth don’t come from getting a specific thing. If and only if may get me a particular object, but I’ll eventually want something else – and the cycle continues. 4. What I really want is to know that I’m not lost to myself, others, and most especially God. In 2015, I’ll do my best not to reduce God, self, and neighbor to any IFF. I can’t do it alone, though. A holy life is always a life lived in communion, always lived in this expanding and sacred cosmos. Unconditionally mine and everybody else’s. If I took the advice of television experts, now is the perfect time for a new plan…for eating healthy foods, getting in better shape, starting a new professional venture, cleaning and organizing my living space, and taking a critical look at my financial situation. Two days into 2015, I haven’t done any of those things. I did have a healthy portion of granola for breakfast, but that’s what I’ve been doing most mornings for well over a year. My husband and I went for a brisk walk last night to check out the local christmas lights, but that’s something we’ve been doing for almost two decades. I’m serving on my local library board and I continue writing, but neither of these are new endeavors. I have no plans for a new organization or cleaning regimen at home. As for finances, things are about the same. Does this lack of new beginnings mean I’m in a rut, or does it mean I’m on a fruitful path? If such things are judged by the results they produce, then the question’s answer is in the future, not the present. If such things are judged by how my life pattern honors God and neighbor, the question’s answer is nowhere (nowhen?) but in this present moment. What are God’s dreams for 2015? Not that I will find an adequate answer, but it’s a good way to keep my ego in check, my feet on the ground, and my heart set on something worthwhile.